Communications Faculty of Sciences University of Ankara Series A2-A3: Physical Sciences and Engineering is a single-blind peer reviewed open access journal which has been published since 1948 by Ankara University, accepts original research articles written in English in the fields of Physics, Engineering Physics, Electronics/Computer Engineering, Astronomy and Geophysics.. Review articles written by eminent scientists can also be invited by the Editor. 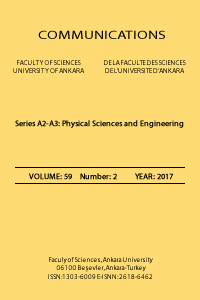 The publication costs for Communications Faculty of Sciences University of Ankara Series A2-A3: Physical Sciences and Engineering are covered by the journal, so authors do not need to pay an article-processing and submission charges. The PDF copies of accepted papers are free of charges and can be downloaded from the webside. Hard copies of the paper, if required, are due to be charged for the amount of which is determined by the administration each year. Manuscripts should be typeset using the LATEX typesetting system or as a DOC file. Authors may submit their manuscript and the covering letter via our submission system. A template of manuscript can be reviewed in http://dergipark.gov.tr/download/journal-file/13094. After the acceptance of manuscripts for publication, we will ask you to submit the TeX or Doc form of the manuscript prepared in accordance with the style of the Journal. Authors are required to submit their Open Researcher and Contributor ID (ORCID) ’s which can be obtained from http://orcid.org as their URL address in the format http://orcid.org/xxxx-xxxx-xxxx-xxxx. Acknowledgements should be given as short as possible at the end of the text. Formulas should be numbered consecutively in parentheses ( ). Footnotes should be avoided if possible, but when necessary, should be short and never contain any important part of the work and should be numbered consecutively by superscripts. All illustrations not including tables (photographs and other films, drawings, graphs, etc) must be labeled as “Figure #. Explanation”. Note that in the cover letter, authors should nominate three potential reviewers and the most appropriate Field Editor of the research. The editorial office may not use these nominations, but this may help to speed up the selection of appropriate reviewers. In the cover letter you may enter details of anyone who you would prefer not to review your manuscript. Bairamov, E. and Ozalp, N., Uniform convergence and numerical computation of the Hubbell radiation rectangular source integral, Radiation Physics and Chemistry, 80 (2011) 1312–1315. Kelley, J. L., General Topology, Van Nostrand, 1970. Huve, G., Takahashi, K., and Hashimoto, M., Brain activity recognition with a wearable fNIRS using neural networks, Mechatronics and Automation, (2017), 1573-1578. The Editor may seek the advice of two, or three referees, depending on the response of the referees, chosen in consultation with appropriate members of the Editorial Board, from among experts in the field of specialization of the paper. The reviewing process is conducted in strict confidence and the identity of a referee is not disclosed to the authors at any point since we use a single-blind peer review process. Ø Copyright on any open access article in Communications Faculty of Sciences University of Ankara Series A2-A3: Physical Sciences and Engineering is retained by the author(s). Ø Authors grant Faculty of Sciences of Ankara University a licence to publish the article and identify itself as the original publisher. Ø Authors also grant any third party the right to use the article freely as long as its integrity is maintained and its original authors, citation details and publisher are identified. It is a fundamental condition that articles submitted to COMMUNICATIONS have not been previously published and will not be simultaneously submitted or published elsewhere. After the manuscript has been accepted for publication, the author will not be permitted to make any new additions to the manuscript. Before publication the galley proof is always sent to the author for correction. Thus it is solely the author's responsibility for any typographical mistakes which occur in their article as it appears in the Journal. The contents of the manuscript published in the COMMUNICATIONS are the sole responsibility of the authors. Ø The contents of the manuscript will not be copyrighted, submitted, or published elsewhere, while acceptance by the Journal is under consideration. Ø The article is clean in terms of ‘plagiarism’, and the legal and ethical responsibility of the article belong to the author. Ø The objectivity and transparency in research, and the principles of ethical and professional conduct have been followed. Authors have also declared that they have no potential conflict of interest (financial or non-financial), and their research does not involve any human participants and/or animals.